Panzer IV is the workhorse AFV of the German Army until the end of WW2, with over 8500 built, second just behind Stug III. Of its many variants, the more dramatic switch happens around the ausf F. into the longer barrel KwK 40 L/43 gun and later the longer KwK 40 L/48 gun. For the past decade Dragon had the best Panzer IVs in the market and the company kitted almost all variants. 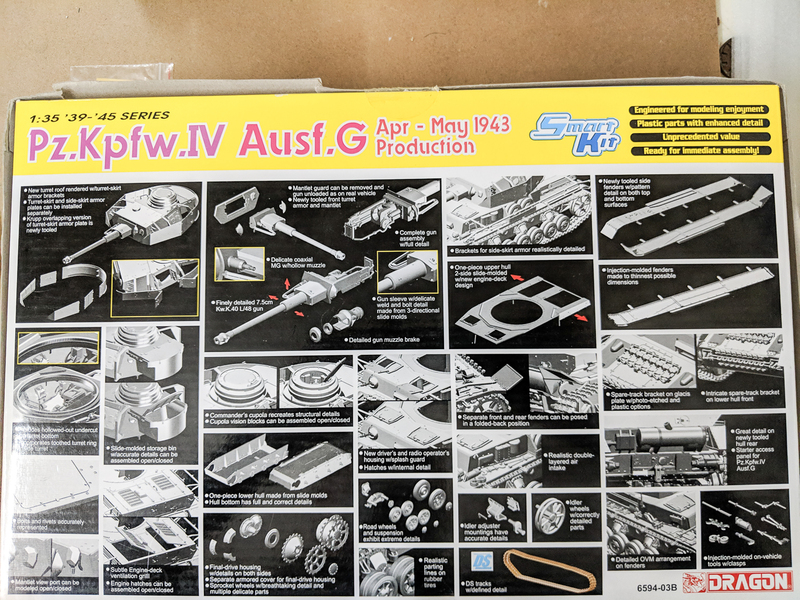 With Border Models seemingly mounting a challenge with its new ausf G, I thought I’d build review one of the Dragon’s in my stash that is not yet reviewed on Armorama, the kit #6594 Ausf.G Apr – May 1943 Production. This is around the mid-late period of the run, with many changes such as more widespread deployment of schurzen, which is included in the box. 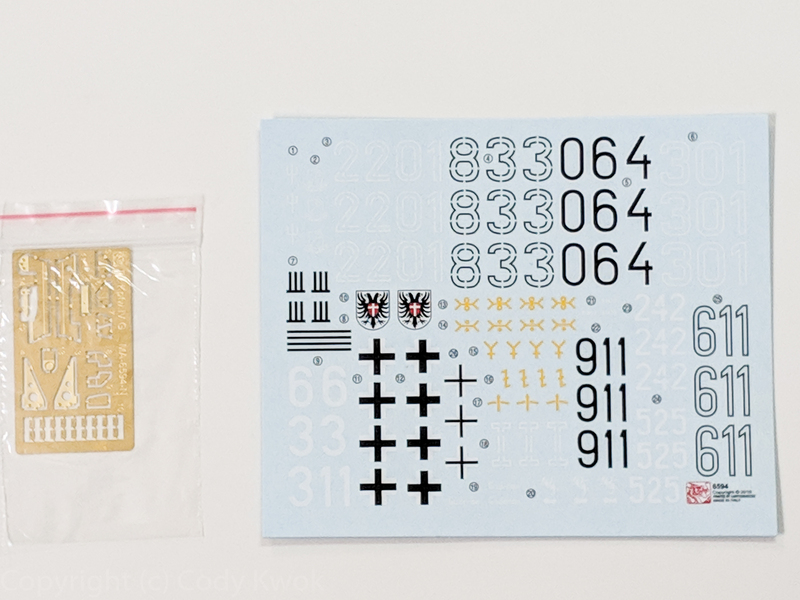 The kit has their typical sharp molding with no flash. 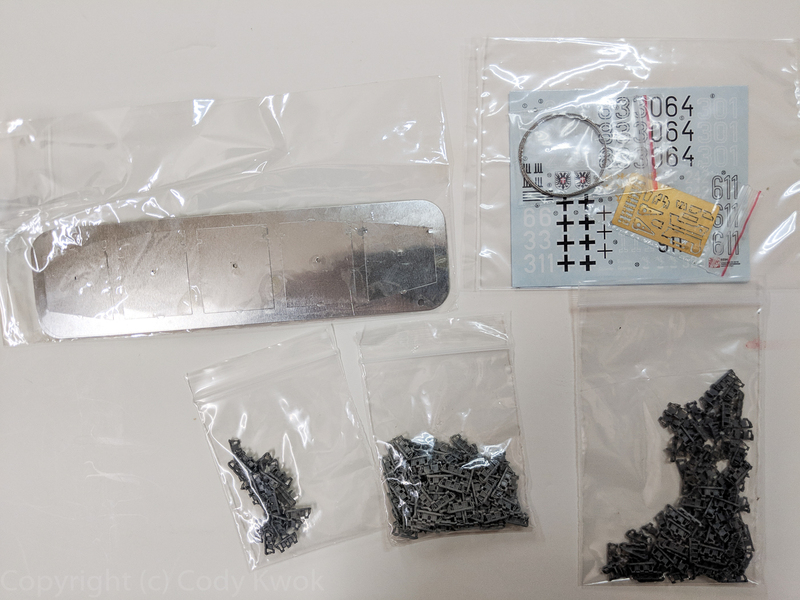 With almost 600 parts and a lot of spares, let’s take a look at the sprues. 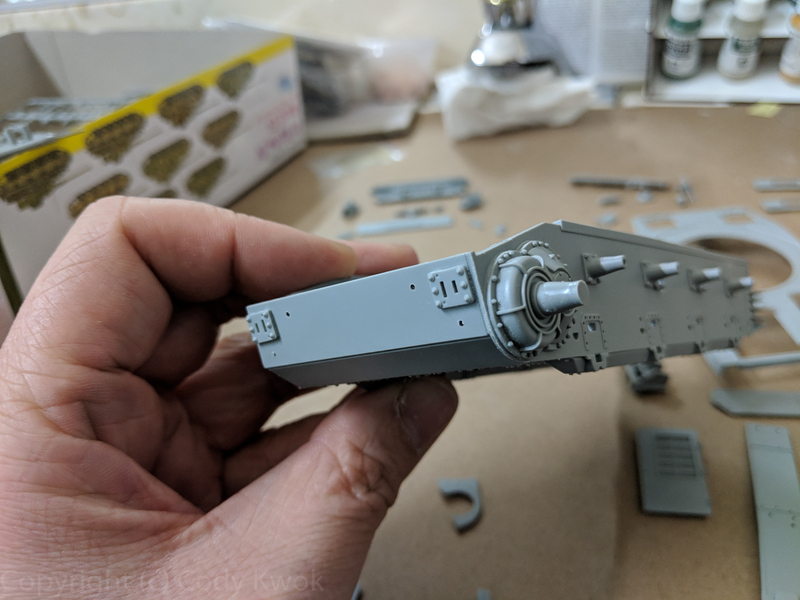 Sprue B are the turret details, including the gun breech. 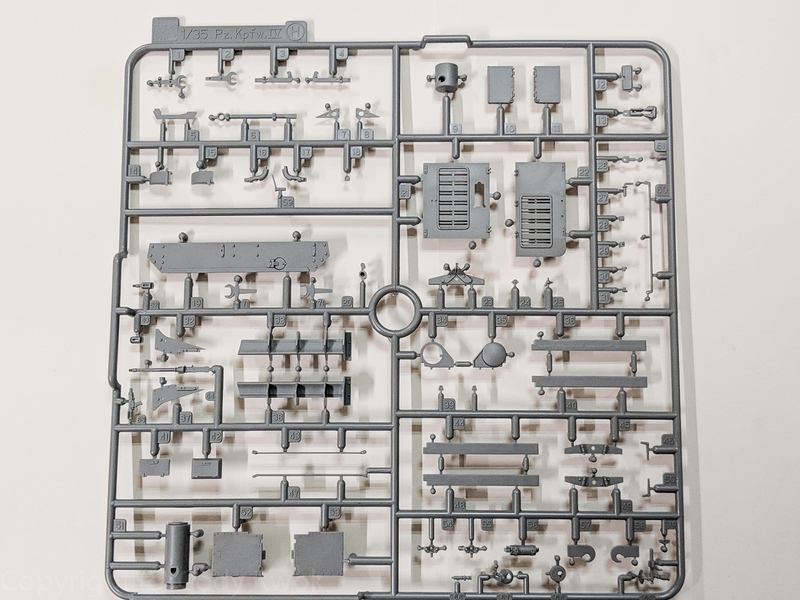 This is sprue E where you only use the stowage bin and mantlet. One of the most “wasteful” ever. 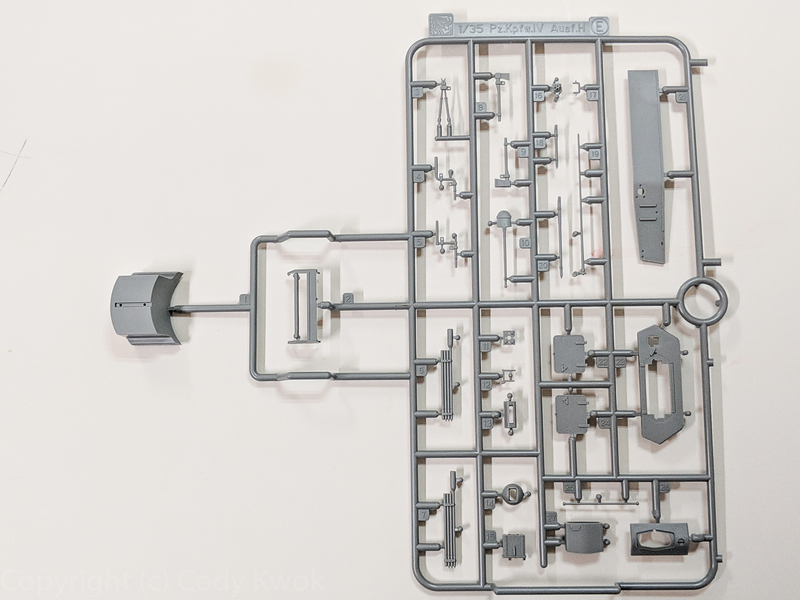 Sprue E are the regular Panzer IV armor surfaces, including extra welded armor. 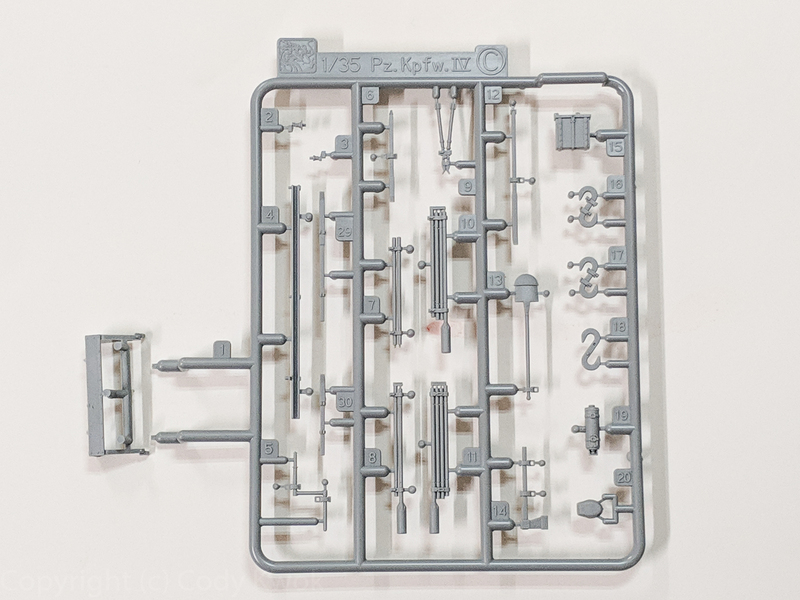 Sprue G are the common Panzer IV turret details. Sprue C are the OVMs and an alternative spare wheel bracket. Clear parts, hull, turrent and the common jack. 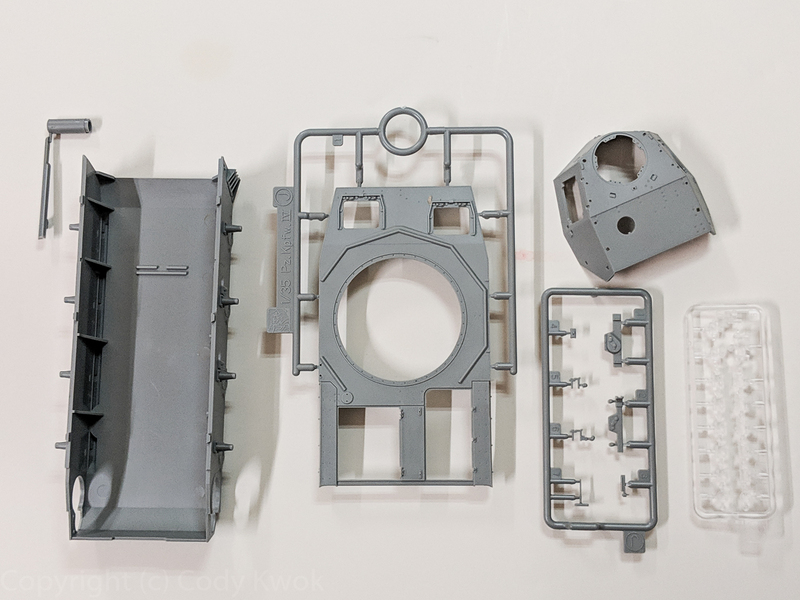 Sprue P has more ausf G parts, and T has the applique armor and support brackets. Sprue S are the side fenders and support brackets for schurzen. Decals, schurzen in steel plates and a small PE fret. I got a version of the kit with Magic tracks and DS tracks. Having built many Dragon Panzer IVs before I recommend building up the kit in a certain sequence to obtain the best fit. The fit on the “canonical” kits such as their ausf F1 are really good,but on kits where Dragon add bits and pieces it is more tricky. Then I work on the upper hull. The fit of engine bay doors H21 and H22 are very snug so make sure you have it all patted down. 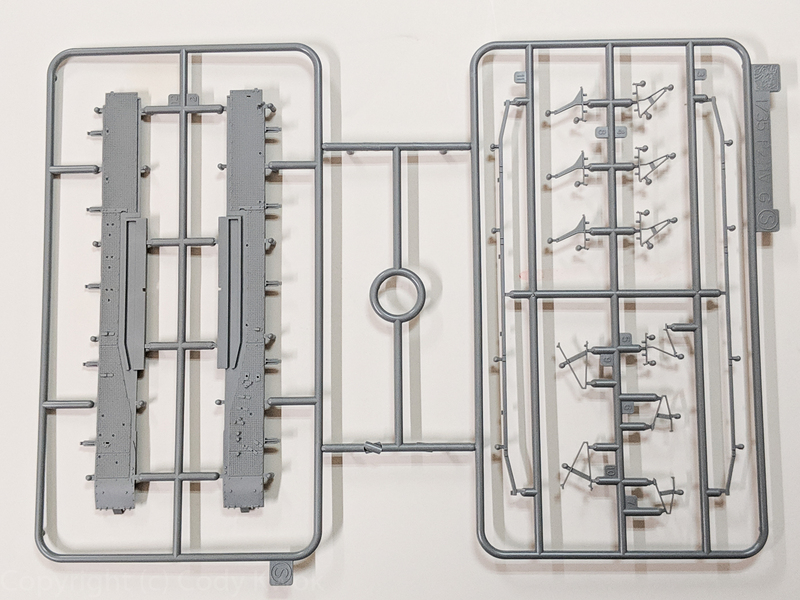 The exhaust bays of the ausf G use the new sprue P for a new style, but the fit is very tight and you almost have to force the parts together. Next I built the walls of the upper hull. I recommend fitting the front wall N2 first to make sure you get the top weld seam fitting perfectly with the hull, then you can get very good fit afterwards for the left and right hull plates N6 and N13. I left the upper rear part H19 off. Then I worked on side fenders. The main challenge of all Panzer IVs are the back mud guards H52 and H53, so I only attached the front mud guards P16 and P17 as subassemblies. The fit is almost perfect here but it’s not easy to get there, I recommend fitting the front mud guard parts P16 and P17 first to the side fenders, then glue the peripheral parts P7 and P8. You usually get a seam here, so run some quick setting glue on it and position the piece until the seam is gone. With the quick setting glue you get styrene goo oozed out and you’d get no seams. After that you fit the fenders to the lower hull. This is the most important step on fitting the tank, particularly the rear mud guards. I find that the fenders are a bit too short on the back, so I trimmed the fitting slots a bit until the rear of the fender can fit perfectly to the hull. Not putting H19 allows you to control how upper hull mates with lower. Add H19 afterwards, the fit is now perfect with the bolt strip along the junction looking like one piece. Adding rear mud guards. The key to getting a good fit here is to make sure the two hinges are aligned, which often is not the case if you didn’t assemble the side fenders carefully. Next we move onto the turret. 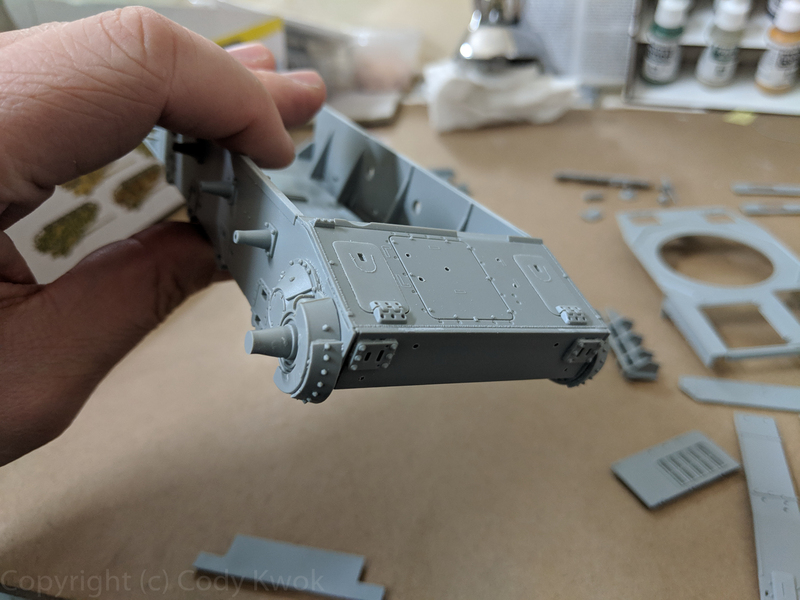 After a lot of failures I realized the best way to get perfect fit for the turret is the glue the upper and lower turret together first, then the front and mantlet. It is much harder to have lower turret fit well to the other two. If you cover up your tank there are no reasons to build the gun breech, but the assembly is quite simple so I often do it. Glye the bottom turret first, making sure the front junctions are flush. Subassmblies for the gun and mantlet. In particular B11, B12 and B34 can be glued to N5 independently. This gives you more control and eventually very flush fit for B11 and B12 so that it looks like one piece, and less chance for accidentally gluing B34 which would prevent your barrel from elevating. 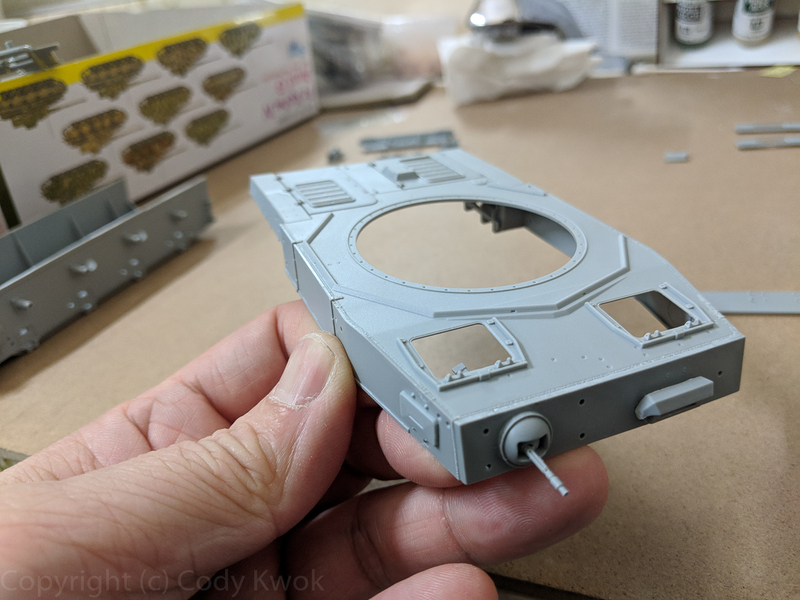 The cupola on the ausf G is new on sprue M. I almost always do the “open” configuration for these since they look more interesting, but the windows subassemblies are a bit of a hassle to keep anchored to M10 (don’t anchor them to M3 as the diagram suggested), and if you don’t take care of them it’ll be some acrobatics to fit part M3. So make sure the windows stay on M10 with a little glue, dry, and then assemble M3. Attach the five M7 parts afterwards. Cupola. Keeping the vision block windows attached makes attaching the clear parts slightly easiler as you don’t need to orient M4/M5. This kit gives you the option of longer barrel B42 or the shorter E20. The shorter variant is for the early Gs. The new part N14 is pretty awesome slide-molded one piece rather than the older 2-piece assembly, which is awesome. For the mantlet assembly I attached N5 to the pivots B11 and B12 to B34 as a subassembly and made sure B34 can move. I also thinned the walls of the smoke discharger G2 further, although AM discharger would also look very awesome here. The lift hooks A53 and A50 are some of the smallest assemblies of the kit, I remove A53 from the sprue but not A50 so that I only have one rather than two tiny parts to work with. The gun breech and simplified turret interior. Now we’re back to the more mundane running gears. There are a few tricks you can speed the assembly up. First off on the suspension springs, the A11+A12 assembly is a bit difficult to handle with my fat fingers, so I left A12 on the sprue and attach sanded A11 to it. Suspension springs are glued on-sprue as well for ease of handling. Next, the return rollers are also quite small to handle and sand. 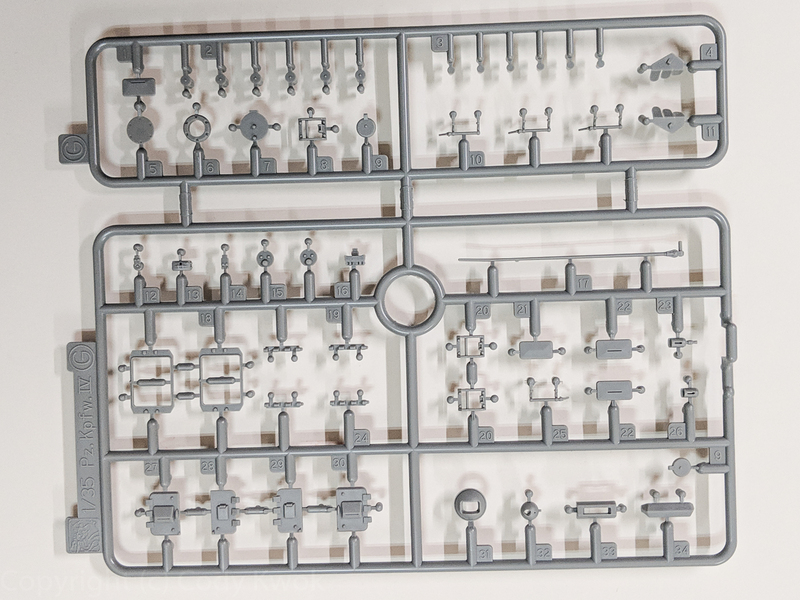 You can leave all the A2s on the sprue (don’t cut the middle linkages either), and cut all A3s off the sprue BUT leave them attached to each other. That way you can assemble the two rows together. Moreover the completed rows of four makes it much easier to handle and sand, you can sand the tire seams out until the end and detach each tire one by one. Return rollers can be “sandwiched” wholesale. Running glue on A1 after you have it aligned. Schurzen support bracket. I frst glued the rail S11 to the two S4/S8 in the middle becuase they have most reliable on-vehicle fit. Then I glued the rail to S7 and S9 by adjusting both the bracket and the rail to achieve the most natural-looking fit. In this kit you need to trim a tab off of S6 and S7, but they have no guides where they attach to the vehicle to I use the rail to make sure they’re at the right place. The applique armor as a separate assembly, but the two rear support brackets are on vehcile because T6 interferes with their attachment. The tabs on the support brackets allows you to detach/attach the applique armor for painting. DS tracks fit pretty well. length-wise. There aren’t a lot of PE on this kit so I attached them at the end, the more difficult ones are the small track brackets on the glacis plate. Finally I test fitted the schurzen. These are steel plates, I found that just by twisting the plate parts breaks off pretty easily and cleanly from the outer plate. Schurzen fitted from back to front. Finally I have the OVM off the vehicle for painting. With the schurzen it’s very difficult to paint them on vehicle. The tool clamps are ok, but I’ll replace them with PE handles later. OVMs. As with all Dragon kits the tool clamps are good but not great, you can thin them with sanding and they’ll look pretty good, or replace with PE. 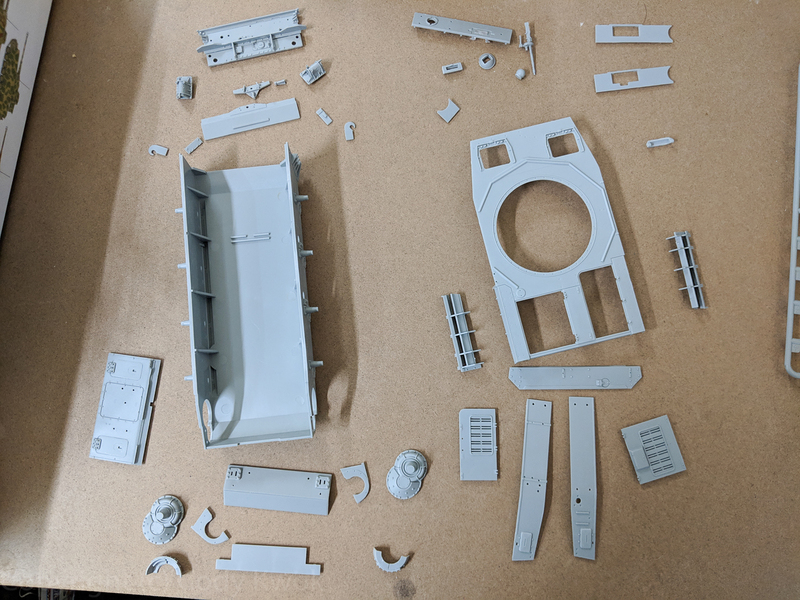 Touted as one of the best Panzer IV G on the market, this Dragon 6594 kit has enough parts for you to build many variants. The kit can be built into a very detailed vehicle OOB, and the much maligned Dragon instructions are actually quite ok here. Highly recommended for intermediate to experienced modeler. Beginning modelers may find some of the fit quite difficult to achieve – that’s the real difference between a Tamiya and a Dragon kit. With Dragon the fit can be great if you have the right sequence, but often that requires a bit of experience.